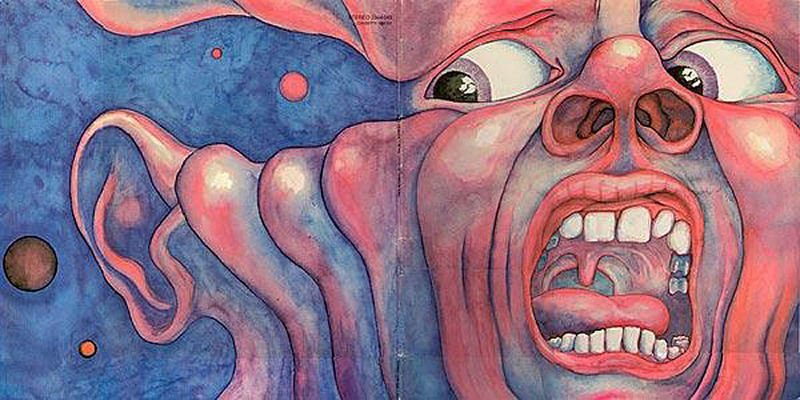 This painting of the 21st Century Schizoid Man appears on the cover of the 1969 record album "Court of the Crimson King" by the British progressive rock group King Crimson. The cover is as strange, haunting and powerful as anything else to do with the group. It was painted by Barry Godber who was an artist and a computer programmer. This was the only album cover he painted. 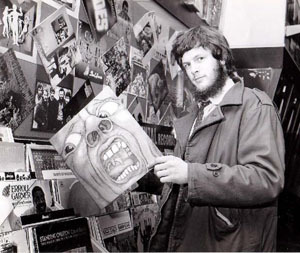 Barry died in February 1970 at the age of 24. 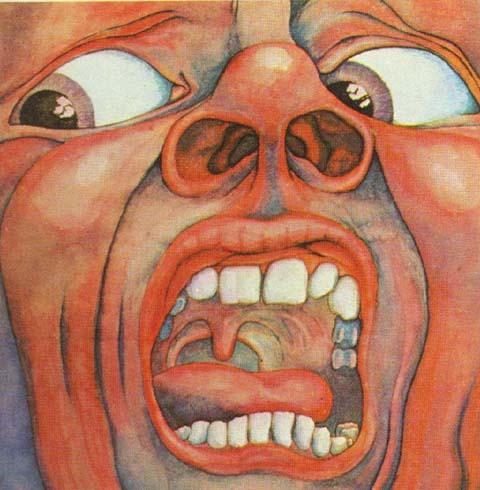 The cover was as much a definitive statement , and a classic, as the album. 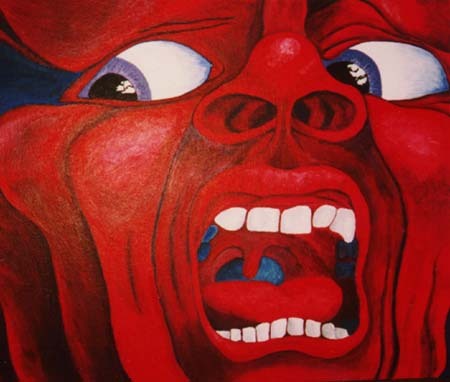 The original painting is owned by Robert Fripp. Update September 2013: I have been a rabid King Crimson fan from day one. This album was released in Oct 1969. I was lucky to experience almost every US tour. Later in life as an fighter pilot and nuclear strike pilot during the cold war years (1970s) I identified with Peter's lyrics in this track and in Epitaph - "If we make it we can all sit back and laugh". I built this page dedicated to Barry Godber in early 1999. There was little information available on the artist. A typo error in my original text referred to Barry as an "American Artist". That error resulted in the beautiful letter I received from Peter Sinfield in July 1999. A humorous and classic eulogy for an old friend. Part of Peter's note is featured in Sid Smith's Band Bio "In the Court of King Crimson" 2001, Helter Skelter Publishing (page 69). I know that face from somewhere....!!!! Just to set the record (or to be sure, - its COVER) - straight!!! Barry was very ENGLISH. He was always an artist having studied at Chelsea Art School with the likes of now famous painters such as erm... Dougie Field. He was one of the most charming, beautiful, in face and spirit, mischievious souls I have ever met. A comparison - well a sort of Nick Drake ... but not as "obviously" profound and moody. He was a darlin' man. . . He got all the girls. . . I used to watch and follow him around with a mixture of admiration and envy. Now the great irony. Perhaps, tired of charming his way through the psychadelic puddles of swinging London instead of applying himself to his ART he decided to get a "real job". We will forever wonder why. Anyway he joined me at a company called at the time -"English Electric Computers" (later ICL) and become, as I had been for many years, a computer operator / programmer...this was a fantastic job to have at the time .... One - we were working, albeit with punched cards and paper tape and those big flicking backwards and forwards reels of tape that you see in old SF movies. Two - we worked shifts and thus having worked so many nights etc ... had days and days of freedom to get very very stoned. You are waiting for the irony ... OK here tis... not long after Mad Bad Barry decided to become less SO... Tired of being told to wear the suit and cut the hair. One day I walked into my bosses office ( Mr. Smith... no really) and handed in my resignation . . .and informed him I was leaving to be FREE and to become a songwriter. 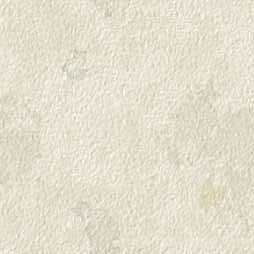 As I recall among his "are you sure" and other words he told me kindly that "my job would be here when I needed it back. . . . ." (Which certainly burnt that bridge!) - So thus my admired free-rogue of a friend Barry Godber joined and I, with much trepidation, left the grey stream. Anyway after the traditional year of starving I met an amazing man called Ian McDonald who said (and this is true) "well I don't think your band is much good but you write some interesting words - you wanna try and write....." He went on to join Giles Giles and Fripp -- me follow on as roadie . . light man.... lyricist ...rename/frame band person - er, the rest is 'istory. While finishing the first album , in need of a cover , I played some of the tracks to Barry (one of the few Artists I knew) and for some reason I had a feeling he would . . . . which he did!! (much to Michael Giles' horror) and then just after hundreds of record shop windows' were full of his art (his face incidentaly in a mirror) he went and died on us. Which to say the least: was inconsiderate of him. I miss him. And I don't much go in for regret and/or missing people. The full painting. Front and back cover.